This month the City of Wanneroo filled an unfinished and unused underpass beneath Marmion Avenue in Merriwa. Built in the 1990s by a developer to link Dunmore Park in Merriwa with Littleham Park in Quinns Rocks, the underpass never opened to pedestrians because of construction difficulties from rock and a water main. 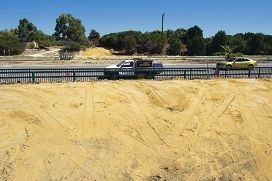 In November 2008, the council decided to fill the existing excavations, and then last July, in its 2012-13 Budget, Wanneroo City Council allocated $250,000 to complete the task. However, acting chief executive Dennis Blair said the final cost, once calculated, would be about $150,000. He said work was done between 9am and 3pm over five days, and the concrete grout filled voids where sand could not be placed.